Looking for implements for a smaller tractor? Joe Spencer discusses a number of options. 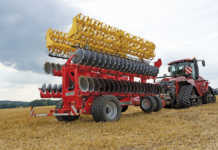 Two-row planter imported by RY Agri. Following my column on small tractors, I received many enquiries from readers about matching implements. 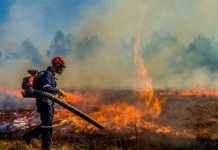 As it happened, a number of these were on display at the Royal Show, the National Vegetable Farmers’ Day, and the Sugarfest Show in Amatikulu. RY Agri, based in Middelburg, Gauteng, imports this two-row planter (above), with row widths ranging from 500mm to 900mm. Seed and fertiliser tubes have separate coulters, and the fertiliser can be applied alongside or below the seed if required. Seed spacing is adjusted by changing gears, and three seed plates, for maize, sorghum and dry beans, are supplied. The fertiliser hoppers are made of a non-corrosive material. The seed hoppers are transparent, so that the level is visible from the tractor seat. The single-row potato lifter, also from RY Agri, has a single, PTO-driven, 850mm-wide web. This also powers the web agitation, and the unique vertical rollers ensure that the digging share collects the entire potato plant. 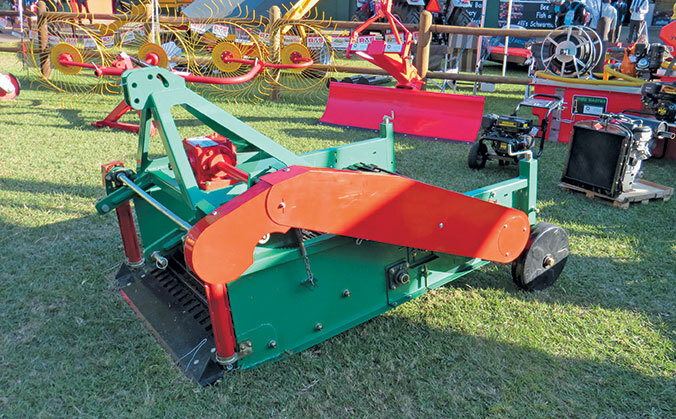 Locust mouldboard ploughs are designed and manufactured by Falcon in Howick, KwaZulu-Natal, with parts common to other locally manufactured ploughs. The range comprises two- and three-furrow models and are ideal for primary cultivation. The two-furrow plough is seen here. 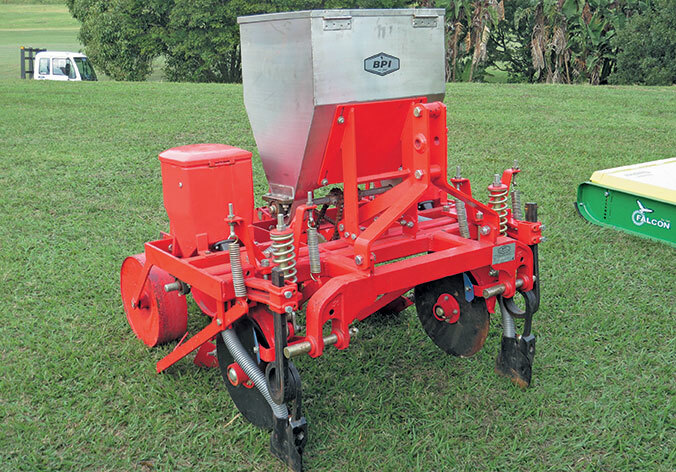 The BPI 90 Mkll two-row mechanical planter has a stainless steel fertiliser hopper and two seed hoppers. 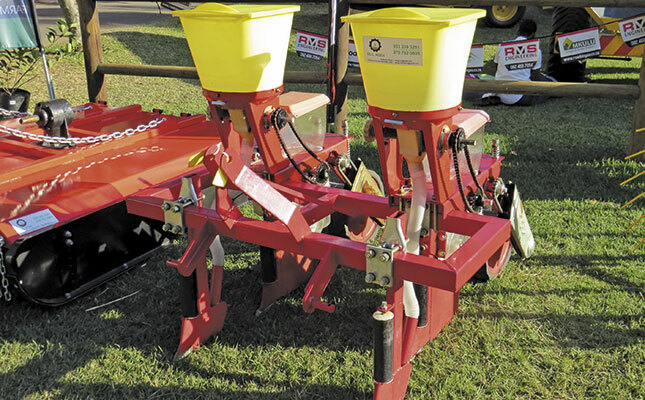 It can be used to plant seeds and apply fertiliser through a disc coulter system and is suitable for maize, sunflower, cotton, dry beans, soya beans and chick peas. 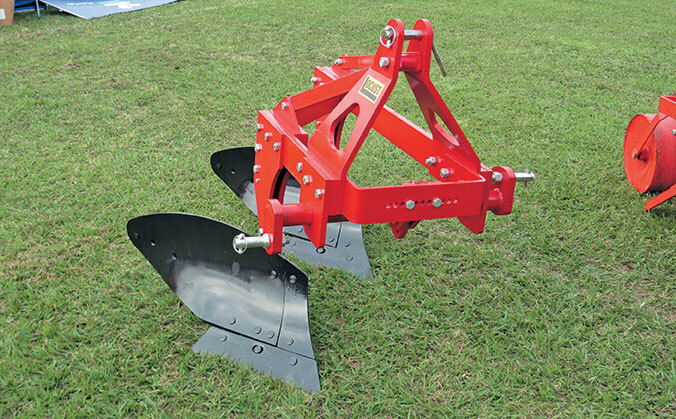 Manufactured in Bothaville, the BPI range of mounted offset disc harrows is available with 10 to 16 discs, and cutting widths from 1 100mm to 1 850mm. The 510mm-diameter discs can work to depths of between 75mm and 100mm depending on soil conditions, and the adjustable gang angle setting. They are suitable for 35kW to 50kW tractors. here can deflect under a load without affecting the working depth. Depth wheels are an option, and a following roller can be fitted so that a consolidated seedbed can be prepared in a single pass. Hinomoto also supplies one-, two- and three-tine rippers. The 12kW Hinomoto JEST E14 tractor is a good match for the Rotivator rotary cultivator. 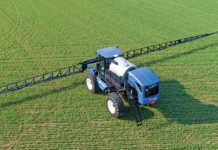 The implement has a wider width than that of the tractor, and the special blade configuration does not cause compaction. It also has a low power requirement. Depth wheels ensure level working and a smooth seedbed. The Rotivator is available in widths between 1 000mm and 1 400mm. Hinomoto Tractors & Implements is based in Honeydew, Gauteng.